Practice in Time: Trash-picked Tuesday: Losing your Lustre? Well, then you need Lustre-Creme! It's Lanolin-Blessed! And for a limited time only, it's on sale for $1.69, regularly $2.00! I pulled this sweet vintage jar out of another trash pile in the woods. Surprisingly, the metal lid is still really nice and just has a few scratches- not bad for being buried in dirt for decades. The bottom is milk glass. I use it to store toiletries in the bathroom. 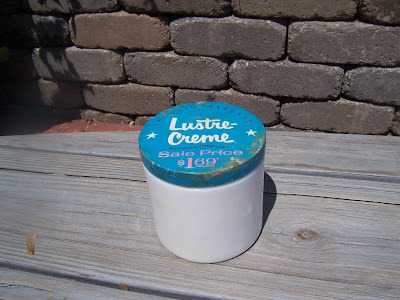 That's part of my obsession with replacing modern product packaging with vintage- I love finding useful containers that I can fill up and get rid of the modern. This works really great in the kitchen (sounds like a future post is in order for that...) as well as in the bathroom.